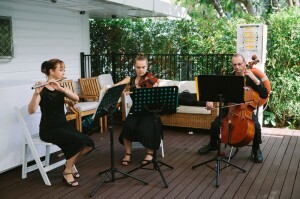 I just wanted to say a belated thank you for the quartet’s performance at my wedding on 17 September at Little Cove and Sugar Wharf in Port Douglas. You were all wonderful and it was a beautiful atmosphere on the day thanks to your music. I loved the classics and our friends were particularly impressed with the Taylor Swift! Just wanted to say a huge thank you to you all for being a part of our ceremony. You sounded so beautiful. It was such an emotional day. I regret that I didn’t get the opportunity to introduce myself and thank you. I had planned on doing so but was literally bombarded after the ceremony! Please pass on our warmest regards to the quartet on behalf of Luke and I. We hope you are well! We just wanted to say thank you to you and your team, the rendition of Blower’s Daughter that you learned (last minute too!) and performed was perfect and for your professionalism while organising and especially on the day. You made this so easy and stress free for us and we can’t thank you enough for that! We would recommend you to anyone who would love to add that touch of class to any special occasion or event. It was wonderful having you play for us on our wedding day. It was one of the main highlights of our reception and many of our guests commented on how amazing you all were. Thank you again for your beautiful flute playing. You produce the most beautiful tone on your instrument. You are always the ultimate professional. 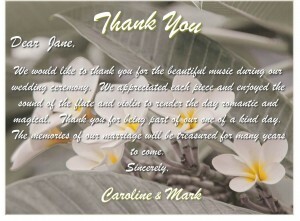 I just wanted to send you a quick email to say thank you so much for your beautiful music on our wedding day. I’m so sorry I didn’t get a chance to thank you on the day – I guess I was a little preoccupied. Your music was absolutely beautiful and we had a lot of guests mention how wonderful you sounded. You helped make our ceremony perfect so thank you again.